So, I decided to start a second quilt in between the Tokyo blocks. 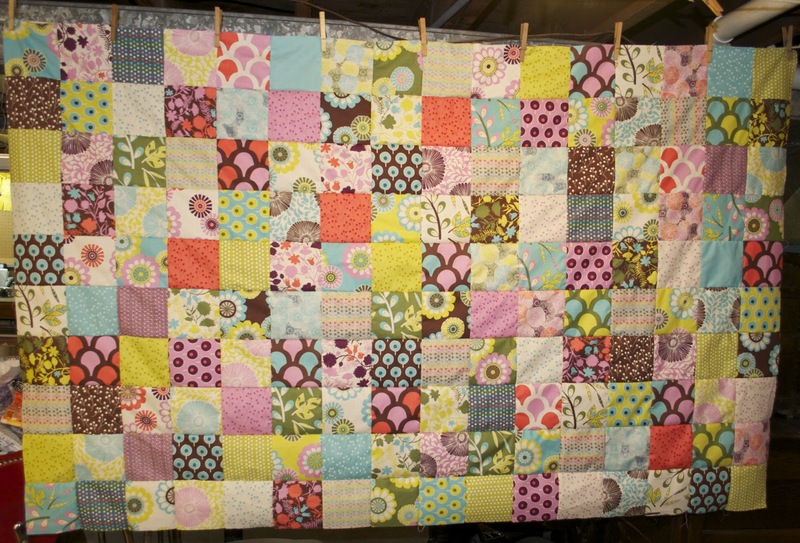 It's nice to break up working with all those tiny squares with something bigger - and I get more out of chain piecing. 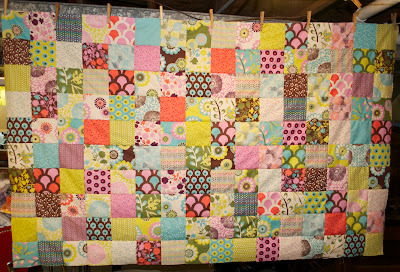 My second quilt is Sweet Dreams feautring Liz Scott's "Sugar Pop" for Moda. It's this fun little grouping that in the words of designer Liz Scott are, "inspired by the ice cream parlor and candy store" and has "bold punchy florals and mod nature motifs." I just love, love, LOVE it! It's been so much fun to work with! I love the bright colors and fun designs. I thought a very traditional patchwork quilt design paired with these very hip, modern fabrics would be a neat idea and let the fabrics really play. This quilt will be 76x76 inches when done and make a perfect lap quilt! Wow, that fabric is great!! I love your idea of traditional piecing + modern fabric. This is going to be awesome when its all put together.